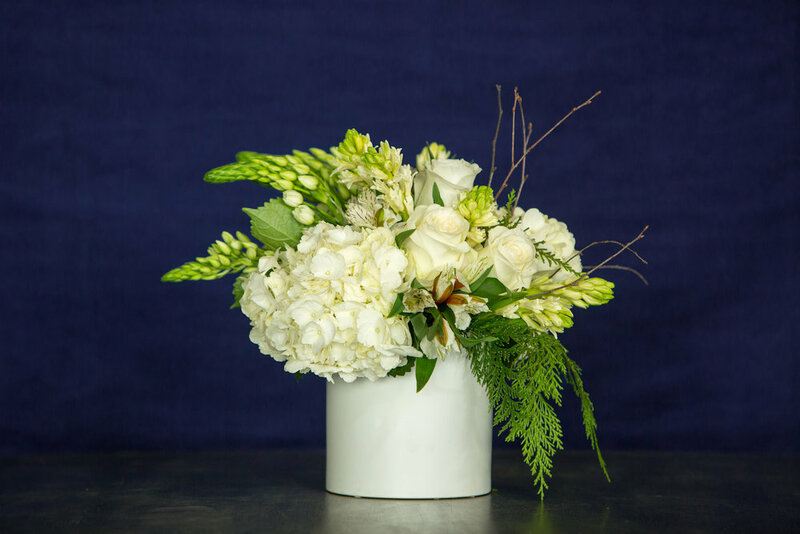 The stems found in Enchantment along with Mini Hydrangea and some greenery. With each collection that I design, I find myself drawn to the colors that are found naturally in the countryside of Northern Virginia. When I envision the tableau for a winter collection, I see the white and ivory associated with snow and moody clouds, but also the crisp blue and yellow of a clear January sky and the pink, purple and lavender found in our expansive sunsets. These colors can be achieved in florals this time of year because the industry offers us just the smallest hints of spring. As with every collection, I have tried to surprise you with some flower and green variety that you don't often see, so look for Hellebore, Agapanthus, Eriostemon and some unique Tulip varieties. The two designs in our collection in white and ivory are the most surprising. Both are lush, low and compact but have a whimsy that is created by their cascading designs, unique stems, simple branches and lacey greeneries. White and green is always on trend and may be all you need if you are choosing to embrace winter. We have four designs in the winter collection that incorporate pink, purple and blue. I wanted to make sure we had sizes and styles that suited your everyday needs with a colorful promise that spring was on the way. “Delight” and “Hints of Spring” are in the lush, low modern style that is the trademark of our studio. But, I also wanted to offer some magical designs that offer a more dramatic effect. “Treasure” and “Enchantment” are taller and more whimsical and entertain the trend toward movement in floral design. We long for sunshine in the winter. Each sunny day we are offered seems a respite from our short, colder days. That’s why I created three designs with delightful, bright yellow flowers using Roses, Tulips and Snapdragons. The Bells of Ireland are such a warm, sunny shade of green. They help us create height in “Everglow” along with lively Snapdragons. “Sunshine” is a favorite among my staff because of the beautiful “S” shape design and “Radiance” is simple and elegant with just Tulips and Fern. Use the button below to view additional images of these designs and pricing. We always offer "Designers Choice" arrangements. These allow us to create something very specific for you. Please call our studio at 703-779-3530 for more information.